Friday I lost someone very dear to me. Things have changed drastically lately. Through divorce I lost half my family. My former sister-in-law Angel was the only person I really kept in contact with. Angel was always a huge supporter of comedy. She moved to Chicago a long time ago to pursue an art career and fell in love with the Chicago comedy scene. She was there during a time when all the cool Chicago comics who comedy nerds know so well were just starting off and finding their voices. Angel was an amazing illustrator who had a keen knack for capturing the energy and buzz of a setting in a static image. Of all her work my favorites were always those of live performances of open mic shows where you could just feel the excitement in the room of people trying and seeing new things for the first time. My favorite art has always been the kind that was deeply personal. Angel had Lupus and wrote and illustrated a graphic novel depicting her double hip and double knee replacement surgeries and how liberating it was afterwards when she was finally able to ride a bike again and do other things people her age were able to do. Mind you, these surgeries all took place while she was just in her twenties. For a person who dealt daily with an immobilizing disease Angel made the most of her unfortunately short life. Angel’s services and funeral are this week. I don’t know if I’m going to go. It’s not entirely even because I don’t think her family wants me there. I feel like I already had my goodbye and I don’t want to lose that memory. Last Monday, five days before Angel passed was my birthday. She sent me a text saying that she really missed comedy a lot and wanted to come out to the open mic I was doing. I told her she should. She was worried about making people uncomfortable and I assured her that it didn’t matter and I’d like to see her again. She came out, we watched the show and jokes back and forth. Maybe it was nothing other than the joy of being around a thing she enjoyed so much that overwhelmed her, but when we parted ways that night she gave me a hug. The only physical interaction we ever really had before that was secretly giving each other the middle finger when no one was looking. She gave me a hug though and said, “Ooh, I hugged you.” I told her it was okay because she didn’t smell too bad. Then we went out separate ways. That’s the goodbye I want to remember forever. I loved that girl. 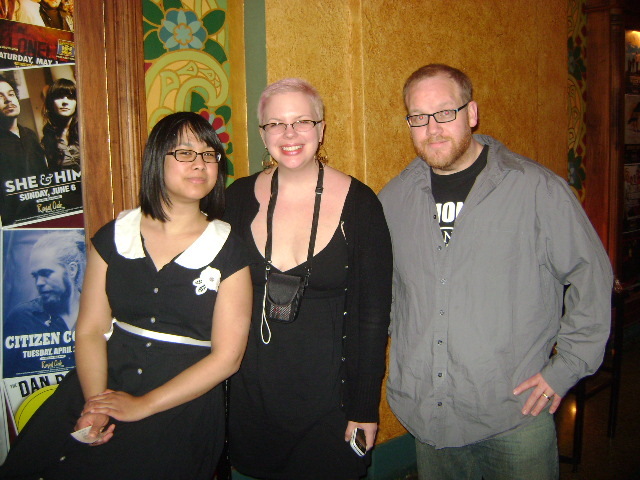 Angel, Kristy and me at the Royal Oak Music Theatre during the Laugh Detroit Comedy Festival. Posted on June 11, 2012, in More Misadventures! and tagged angel busque, chicago comedy, mike bobbitt, offthemike. Bookmark the permalink. 1 Comment. So sorry for your loss… I know that’s a hacky cliche’ thing to say, but that was a pretty touching eulogy. I may end up making the most out of my day and being being nice to people because of it….take that as a high compliment.